&&&& What isCuppingTherapy? &&&& Cupping is an ancient Chinese method of causing local congestion. A partial vacuum is created in cups placed on the skin either by means of heat or suction. This draws up the underlying tissues. When the cup is left in place on the skin for a few minutes, blood stasis is formed and localized healing takes place. Cupping therapy has been further developed as a means to open the 'Meridians' of the body. Meridians are the conduits in the body through which energy flows to every part of the body and through every organ and tissue. There are five meridians on the back that, when opened, allow invigorating energy to travel the whole length of the body. It has been found that cupping is probably the best way of opening those meridians. Cupping has also been found to affect the body up to four inches into the tissues, causing tissues to release toxins, activate the lymphatic system, clear colon blockages, help activate and clear the veins, arteries and capillaries, activate the skin, clear stretch marks and improve varicose veins. Cupping is the best deep tissue massage available. Cupping, the technique, is very useful and very safe and can be easily learned and incorporated into your family health practices. Now plastic cups based on the traditional cups by applying the traditional cupping therapy together with the magnetic therapy. The new cups have done away with the traditional firing. This has made the application of the cups more easily and safely. It has a good penetrating effect and a big drawing strength. It has not only improved efficacy but also simplified the procedures of cupping therapy. The improved plastic cups for ancient Chinese cupping therapy are now available for supply. They are easier to be handled and safer to be used for self-treatment at home. In China, the new cups are very popular for family cupping treatment. &&&&& CUPPING &&&&& by Subhuti Dharmananda, Ph.D., Director, Institute for Traditional Medicine, Portland, Oregon. http://www.itmonline.org/arts/cupping.htm#figure%201. Cupping refers to an ancient Chinese practice in which a cup is applied to the skin and the pressure in the cup is reduced (by using change in heat or by suctioning out air), so that the skin and superficial muscle layer is drawn into and held in the cup. In some cases, the cup may be moved while the suction of skin is active, causing a regional pulling of the skin and muscle (the technique is called gliding cupping). This treatment has some relation to certain massage techniques, such as the rapid skin pinching along the back that is an important aspect of tuina (12). In that practice, the skin is pinched, sometimes at specific points (e.g., bladder meridian points), until a redness is generated. Cupping is applied by acupuncturists to certain acupuncture points, as well as to regions of the body that are affected by pain (where the pain is deeper than the tissues to be pulled). When the cups are moved along the surface of the skin, the treatment is somewhat like guasha (literally, sand scraping), a folk remedy of southeast Asia which is often carried out by scraping the skin with a coin or other object with the intention of breaking up stagnation. Movement of the cups is a gentler technique than guasha, as a lubricant allows the cup to slide without causing as much of the subcutaneous bruising that is an objective of guasha. Still, a certain amount of bruising is expected both from fixed position cupping (especially at the site of the cup rim) and with movement of the cups. Traditional cupping, with use of heated cups, also has some similarity to moxibustion therapy. Heating of the cups was the method used to obtain suction: the hot air in the cups has a low density and, as the cups cool with the opening sealed by the skin, the pressure within the cups declines, sucking the skin into it. In this case, the cups are hot and have a stimulating effect something like that of burning moxa wool. In some cases, a small amount of blood letting (luoci; vein pricking) is done first, using a pricking needle, and then the cup is applied over the site. The pricking is usually done with a three-edged needle, applied to a vein, and it typically draws 3–4 drops of blood (sometimes the skin on either side is squeezed to aid release of blood). A standard thick-gauge acupuncture needle or plum blossom needle may be used instead. This technique is said to promote blood circulation, remove stasis, and alleviate swelling and pain. It is employed especially when there is a toxic heat syndrome and for a variety of acute ailments. The following report is derived mainly from a survey of reported cupping techniques published in 1989 (1), supplemented by information from acupuncture text books (5–9). @@EARLY HISTORY@@ The earliest use of cupping that is recorded is from the famous Taoist alchemist and herbalist, Ge Hong (281–341 A.D.). The method was described in his book A Handbook of Prescriptions for Emergencies, in which the cups were actually animal horns, used for draining pustules. As a result of using horns, cupping has been known as jiaofa, or the horn technique. In a Tang Dynasty book, Necessities of a Frontier Official, cupping was prescribed for the treatment of pulmonary tuberculosis (or a similar disorder). More recently, Zhao Xuemin, during the Qing Dynasty, wrote Supplement to Outline of Materia Medica, including an entire chapter on “fire jar qi” (huoquan qi). In it, he emphasized the value of this treatment, using cups made of bamboo or pottery, in alleviating headache of wind-cold type, bi syndrome of wind origin, dizziness, and abdominal pain. The cups could be placed over acupuncture needles for these treatments. One of the traditional indications for cupping is dispelling cold in the channels. This indication is partly the result of applying hot cups. For example, bamboo cups would be boiled in an herbal decoction just prior to applying to the skin (this is one type of shuiguanfa, or liquid cupping, so-called because a liquid is incorporated into the treatment). Both liquid cupping and cupping over an acupuncture needle are favored for treatment of arthralgia. Cupping also is thought to dispel cold by virtue of its ability to release external pathogenic factors, including invasion of wind, damp, and cold. @@MODERN CUPPING@@ During the 20th century, new glass cups were developed (see Figure 1). Common drinking glasses have been used for this purpose, but thick glass cupping devices have also been produced and are preferred. 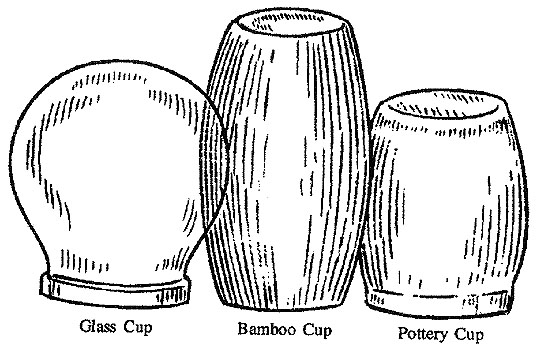 The introduction of glass cups helped greatly, since the pottery cups broke very easily and the bamboo cups would deteriorate with repeated heating. Glass cups were easier to make than the brass or iron cups that were sometimes used as sturdy substitutes for the others; further, one could see the skin within the cup and evaluate the degree of response. The glass cups are depressurized by providing some fire in the cup to heat up the air within just prior to placement. For example, hold a cotton ball dipped in alcohol with a pincer, ignite it, hold it in the cup, then rapidly apply to the skin; this is called shanhuofa (flash-fire cupping; see Figure 2). Sometimes, a small amount alcohol is put in the cup and lit; this method is called dijiufa (alcohol-fire cupping). At the end of the 20th century, another method of suction was developed in which a valve was constructed at the top of the jar and a small hand-operated pump is attached so that the practitioner could suction out air without relying on fire (thus avoiding some hazards and having greater control over the amount of suction). Both glass and plastic cups were developed, though the plastic ones are not very well suited to moving along the skin once in place, as the edges are not entirely smooth and the strength of the cups is limited. The modern name for cupping is baguanfa (suction cup therapy). In order to allow easy movement of the glass cups along the skin, some oil is applied. Medicated massage oils (with extracts of herbs) are particularly useful for this purpose. Since the cups are applied at room temperature, the indication of removing cold from the channels is no longer as applicable, at least to stationary cups. There is some friction generated with moving cups, so that there is a small but significant amount of heat applied by that method, especially if a warming oil is used as lubricant. Generally, the cup is left in place for about 10 minutes (typical range is 5–15 minutes). The skin becomes reddened due to the congestion of blood flow. The cup is removed by pressing the skin along side it to allow some outside air to leak into it, thus equalizing the pressure and releasing it. Some bruising along the site of the rim of the cup is expected. Today, cupping is mainly recommended for the treatment of pain, gastro-intestinal disorders, lung diseases (especially chronic cough and asthma), and paralysis, though it can be used for other disorders as well. The areas of the body that are fleshy are preferred sites for cupping. Contraindications for cupping include: areas of skin that are inflamed; cases of high fever, convulsions or cramping, or easy bleeding (i.e., pathological level of low platelets); or the abdominal area or lower back during pregnancy. Movement of the cups is limited to fleshy areas: the movement should not cross bony ridges, such as the spine. Following are some of the recommended treatment sites for various disorders. @@Respiratory Diseases@@ · · For chronic bronchitis and asthma, one can apply cupping at the following points: dingchuan, dazhui (GV-14), shenzhu (GV-12), geshu (BL-17), xinshu (BL-15), jueyinshu (BL-14), feishu (BL-13), fengmen (BL-12), dashu (BL-11), tiantu (CV-22), shanzhong (CV-17), huagai (CV-20), and zhongfu (LU-1). [see: Acupuncture treatment of asthma for more information about several of these treatment sites]. · · For pediatric bronchitis: blood letting followed by cupping at dazhui (GV-14). · · For pediatric acute bronchitis: feishu (BL-13), shenchang (KI-25), lingxu (KI-24). @@Digestive Diseases@@ · · For dysentery, early morning diarrhea, and acute and chronic gastritis, perform cupping in the following areas: around the navel; at the bladder meridian shu points; or these stomach meridian points: burong (ST-19), guanmen (ST-22), huaroumen (ST-24), tianshu (ST-25). · · Pediatric indigestion: dachangshu (BL-25). @@Pain Syndromes@@ · · Shoulder blade: jianwaishu (SI-14) and tianzhong (SI-11). · · Loins: shenshu (BL-23), qihaishu (BL-24), guanyuanshu (BL-26). · · Head: taiyang and yintang for refractory headaches and migraines; dazhui (GV-14) and baihui (GV-20) for parietal and occipital headaches; for trigeminal neuralgia: qihu (ST-13), fengchi (GB-20), sizhukong (TB-23), jiache (ST-6); for toothache: dashu (BL-11), with acupuncture, massage, and cupping at yifeng (TB-17), jiache (ST-6), xiaguan (ST-7), and hegu (LI-4). · · Soft tissue injury: treat local pressure pain points and area of swelling; use plum blossom needling followed by cupping; additionally or alternatively use points above or below the site of injury along the channels that pass through the injury. @@Gynecological Disorders@@ · · Infertility and irregular menstruation: shenshu (BL-23) with movement of cup downward (treat with acupuncture first, then do cupping). · · Leukorrhea: yaoyan (extra point under the 3rd lumbar vertebra) and around baliao (BL-31 through BL-34). · · Uterine cramps: needle zusanli (ST-36) and guanyuan (CV-4) and do cupping at guanyuan (CV-4). @@Miscellaneous@@ · · Common cold: dazhui (GV-14). · · Insomnia: xinshu (BL-15), geshu (BL-17), shenshu (BL-23). · · Facial paralysis: needling and cupping dazhui (GV-14), along with needling local facial points. @@RECENT RESEARCH:@@ The following protocols were reported to provide good results in individual clinical research reports: a. a. Head pain (2): headache, toothache, sore throat, redness and soreness of the eyes, treated with blood letting followed by cupping. Treatment is applied to dazhui (GV-14) and dingchuan. b. b. Frozen shoulder (3): after acupuncture at jianyu (LI-15) and jianliao (TB-14) to get propagated qi reaction, use pricking of ashi points followed by cupping over the bleeding area for 10–15 minutes. Ten treatments is a course of therapy. c. c. Acute trigeminal neuralgia treating with blood letting followed by cupping (4): treatment is applied to dazhui (GV-14) and feishu (BL-13). d. d. Acne (10): treatment is to use bloodletting followed by cupping at feishu (BL-13) and geshu (BL-17) on one day, then xinshu (BL-15) and ganshu (BL-18) the next day, alternating treatments for a total of eight days. e. e. Urticaria (11): perform cupping at shenque (CV-8) three times consecutively for ten minutes each time. This is done for three days, followed by one day rest, and another three days as needed. f. f. Acute diseases (13): fever and headache due to infection, acute conjunctivitis, lumbar sprain; perform blood letting at dazhui (GV-14), and then cupping (which promotes further bleeding). ####TREATMENT SUMMARY#### Cupping therapies often follow the point selection pattern that is used for standard acupuncture therapy, with somewhat greater emphasis on the use of back points (due to the ease of performing this technique there). In particular, most practitioners rely on using back shu points (bladder meridian) and dazhui (GV-14). Cupping is frequently applied after treatment by acupuncture, blood letting, or plum blossom treatment. @@@@Functions: Expelling internal evils such as wind, cold, damp, heat, toxin. Opening qi and blood, dredging channels, adjusting balance between yin and yang. Promoting metabolism, making the spirit vigorous, improving the functions of the immune system. Reducing hyperlipmia, high blood sugar to prevent conditions caused by these factors. Eliminating fatigue and refreshing physical strength. Features: 1. Safe without the possibility of being scorched since the conventional cupping apparatus uses fire while this instrument acts by vacuum gas drawing. 2. Self-manipulating, easy to manipulate. 3. Adjustable negative pressure in the cup. 4. No any side effects. Treatment: This cupping instrument can be used to treat neurasthenia, scapulohumeral periarhritis, sequla of cerebral thrombosis, bronchitis, arthritis, cervical vertebra disease, hypertension, skin problems, rheumatism, asthma, insomnia, sciatica, pains, obesity, prostatitis, chronic lumbar muscle strain, etc. 1， Traditional Chinese medicine ,china treasure. 4,human body muscle less the part or furriery, brothers, joint can use the edible to make into a turn the mat place a bottle bottom then reach to seal come pletely the result.